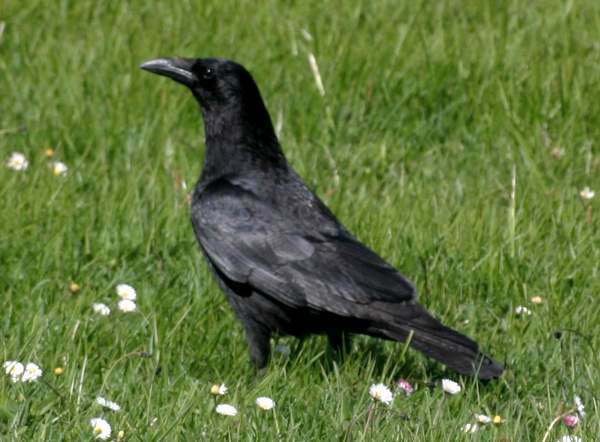 About the same size as a Rook, but with feathered thighs and feathers around the base of the beak, the Carrion Crow is occasionally seen feeding in gardens and even more often 0on roofs and TV aerials. In flight it can be distinguished from a Rook by its squarer tail and slower wing beats. Carrion Crows eat young birds as well as birds eggs, worms, insects, fruit and seeds; they will also accept bread and a range of kitchen scraps. The twig-based nest of the carrion crow is lined with hair and bark and is usually built in the fork of a tree, and the eggs are pale blue-green with dark brown and grey markings. Both male and female adults feed the young birds.